Hon. Prime Minister Ranil Wickremesinghe, Hon. Navin Dissanayake, Minster of Plantation Industries, Your Excellencies, Mr. Ranjith, Secretary of Ministry of Plantation Industries, Chairman – Sri Lanka Tea Board, Chairman – Tea Research Institute, Chairperson – Export Development Board, Chairman – Sri Lanka Export Credit Insurance Corporation, Chairman – National Chamber of Commerce, Chairperson – Women’s Chamber of Commerce and Industries, Officials from Government Organisations, Fellow Members of the Tea Trade, on behalf of the Tea Exporters Association, it’s my pleasure to warmly welcome you to the 19th Annual General Meeting of the Tea Exporters Association. One-hundred-and-fifty years is a long time. Sri Lanka’s tea industry has just completed 150 years. Tea is now considered a traditional industry, with most Government policy makers not making much effort to look at strategies for the tea industry, as it is considered mature and a stalwart of all industries – basically a role model to other foreign exchange earners. We have roots at all levels and if you look at it, we have more than two million people depending on this industry. It is a very important industry – we produce around 300 million kg annually and earn about $ 1.6 billion in foreign revenue to the country. But – tea is a global industry. We believe that this industry could generate much more benefit to the country. We have great challenges ahead to keep up with the competition in the international market and at the same time, to meet local challenges. Global markets are rapidly changing from traditional ways of consuming, trading and marketing. We need to meet these challenges and take our products into consumer markets. The annual global tea market growth is approximately 5.5%. The current production in Sri Lanka is approximately 300 million kg, only about 5.4% of the world Tea production – inadequate as you can see – and unless we make changes to the current model we will not move forward and in fact, continue to see a decline. Sri Lanka used to supply 8% of the world’s tea production 10 years ago. Our current supply has come down to 5.4%. For us to be competitive, the current model needs to be changed. The current model consisting of plantations, small holders, factories and auctions – need to be re-looked at to improve efficiency – reduce costs be more productive and competitive and more innovative in order to make the industry better support the local community to maintain the sustainability of this industry. We need a clear strategy for the industry. A few years ago we discussed a lower production and consequent higher prices, but now we have changed and are planning to increase production. We need a consistent policy. Automation of the Colombo Tea Auction will improve our efficiency and reduce cost. Ceylon Tea is preferred in certain markets and we need to supply these markets with Pure Ceylon Tea. We need to continue our promotion and marketing campaigns for Ceylon Tea and Sri Lankan brands in markets where Ceylon Tea is the preferred beverage. At the same time we need to market Ceylon Tea in markets which do not know about Ceylon Tea and look for avenues for increasing our exports of premium teas and providing teas at affordable prices for the economy segment. We have selected as our theme today “Out of the box thinking”. Traditional methods have advantages and disadvantages. We need to make certain changes to our traditional strategies to be more competitive in the global market. Of the teas produced in Sri Lanka, around 90% is exported to the global market and only around 10% is supplied to the local market. We need to understand how China has evolved from being a commodity supplier to a market economy during the last 20 or 30 years. So “Out of the box” is the theme and challenge for all tea sectors. This is one of the most difficult times for the industry. Our major markets Russia, Iran and Turkey, which imported almost half of our annual production, are under tremendous pressure due to sanctions and/or currency issues. The Russian Ruble has devalued over 17%, the Turkish Lira by 60% and the Iranian Rial by almost 150% during the current year. The buying power of these countries being reduced, they find it difficult to pay for their requirements of tea. We need to find solutions to these issues. We also have other issues like MCPA and Hexaconazole from Japan which is now getting solved. Europe, Canada and USA constantly keep improving their standards for imports to protect consumers. Tea is mostly consumed as a health beverage and every attempt must be made to maintain the purity of the product. There is a general decline of Ceylon Tea quality during the past few decades and if we do not make an effort to manufacture quality Teas, Ceylon Tea will lose its exclusivity in the international market. There are many issues faced by the Producer community, which need urgent attention. The sudden ban of Glyphosate in 2015 was a major setback to the industry which lost large sums of foreign exchange. However, we are aware that we need to find alternate methods for our issues at the plantation levels as Glyphosate could again be a problem in a few years’ time. So Research and Development is important which we lack very badly. This is a job for the TRI and a lot of work will have to be done by them. However, TRI need a more focused strategy, funds and infrastructure to address industry issues. We need to give more attention to develop infrastructure, research and development of the plantation sector at all levels, growing, quality improvement, manufacturing and marketing. At the exporter level, a few companies have ventured into new and innovative products to meet international market demands. Investments are needed at all levels including infrastructure development, research and development and factory upgrading. We look forward to the regulators to offer incentives and tax benefits for the development and modernisation of this industry. With the current business environment, the economic service charge is very excessive and a big burden to the industry. From the time James Taylor started in 1867, it was a case of innovation and risk taking. Now we badly lack these qualities in our industry. We continue to work the way things have been done for ages without innovation and risk taking for product development and market penetration. We believe that the Sri Lanka tea industry can work together to bring in much more foreign income to the country. It could be by increasing the quantity produced. It could be by increasing value addition. Increasing the quantity of tea processed could be done both with local production and also by importing. The Tea Exporters Association has been requesting for the Tea Hub concept for more than 20 years without any success. We should not damage or disturb the Pure Ceylon Tea concept which is preferred by some countries. The idea is that we should have all teas available in Sri Lanka for Sri Lankan exporters to export by adding value by way of branding, packaging, etc. The Hon. Prime Minister has a vision to make Sri Lanka a Hub in the region. 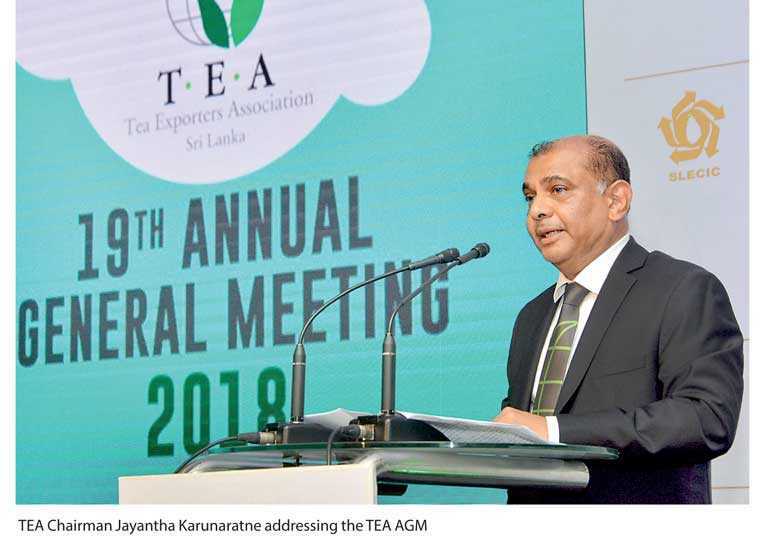 Tea industry can be a major player to make Sri Lanka the most sought-after centre for tea globally. We can invite global players from overseas to invest in Sri Lanka to have their production facilities here which will help local industries including packaging, shipping, finance and infrastructure building in Sri Lanka. However, for this we need a consistent policy. As we are aware, the tea export sector annually pays about Rs. 3 billion by way of a cess and a promotional and marketing levy. We must thank the Hon. Minister of Plantation Industries and Mr. Paskaralingam for getting Cabinet approval to get the bulk cess reduced to Rs. 10 per kg and remove 1% import duty on tea imports. Also the Hon. Minister of Plantation Industries has agreed to reduce the promotion and marketing levy by 50% by the end of this year and abolish same by 2019. The Promotion and Marketing Levy collected over a period of eight years exceeding Rs. 8 billion was not properly utilised to promote Ceylon Tea or Sri Lankan tea brands overseas. We did not have a brand promotion scheme for some time. We thank the Hon. Minister of Plantation Industries for getting Cabinet approval to utilise Rs. 500 million from the Promotion and Marketing Fund for brand promotion for the current year. Sri Lankan brands can take the Ceylon Tea image globally and strengthen the Ceylon Tea demand globally from the consumers. Firstly, to award tea estates who manufacture and supply tea to the export market under the theme “Total Excellence”. Secondly, to offer scholarships to children of plantation workers. We have selected students from plantation areas and they will be given scholarships for their education on a monthly basis until their education is over. Furthermore, two of our senior colleagues who passed away this year will be remembered. One is from the export trade and the other is from broker community. I have heard it said in many forums that the tea industry is not united, but that is not true. We are all in agreement to make the tea industry better and more sustainable and to help the workforce involved in the business and bring increased export revenue to the country. We only have a few differences of opinion regarding importation of tea. We can assure sceptics that tea importation can be done without damage to the Ceylon Tea image, but could be done in a separate area for blending and packing which will bring the country export revenue which is very important. We assure the producer community that by value adding with imported teas in Sri Lanka, Sri Lankan tea prices will not go down, but in fact it should go up as happened in the 1980s. We can do this in such way that a Pure Ceylon Tea image will not be harmed. It’s not difficult to have a separate model for this purpose. My only plea is that we look at everything from a collective mindset of the Ceylon tea industry – We are a 150 year old industry that needs to go beyond what we have been doing in the past. That cuppa we have is magic – magic that can touch hearts and souls and break many divides. So let’s work on that – the road is not going to be easy but collectively we can do it.